and a great way to celebrate Mardi Gras! 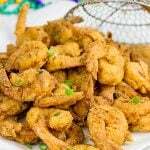 I find that a lot of folks fear Cajun and Creole cuisine because they don’t like spicy foods. Spicy doesn’t necessarily mean burn-your-tongue-off hot. I’m not sure where the misconception came from that pouring cayenne pepper on a dish all of a sudden makes it Cajun. 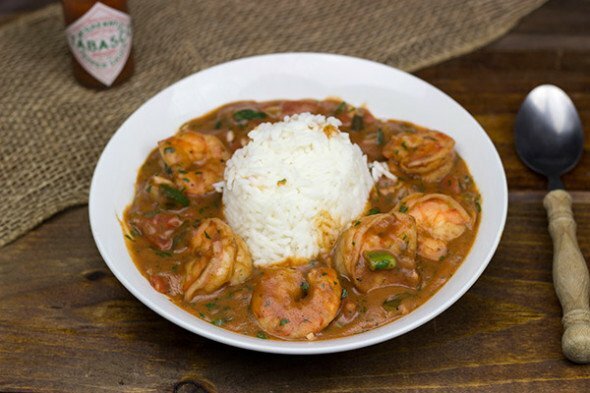 This Shrimp Etouffee recipe doesn’t even call for cayenne pepper. (Of course, you could add some if you like heat…but I often don’t use cayenne in this dish.) I do, however, use a creole seasoning, and cayenne is one of the many spices that go into this blend. But I find that most creole seasonings will not burn your mouth off. (Just make sure to taste a little bit before adding it to the recipe, and then just adjust the amount to your own personal taste.) I typically end up serving this Shrimp Etouffee with a bottle of hot sauce…that way people can add as little or as much heat as they want. The real flavor for this etouffee starts with making a roux. If you’ve never made a homemade roux before, don’t be afraid of it! It’s just butter (or oil) and flour cooked on a very low heat for about 20-25 minutes. The catch is that you’ll need to stir the roux quite often to keep the flour from burning. You can keep working on other things in the kitchen and just frequently stir the roux, but you can’t exactly wander off. And make sure the heat is on low! The next layer of flavor comes from sauteing the diced onion, celery, and bell pepper in the cooked roux. (Like most Louisiana dishes, this Shrimp Etouffee uses onion, celery, and bell pepper as the base…aka “the Holy Trinity of Cajun Cooking.”) After that, just toss in some tomatoes, spices, and shrimp…and you’ve got a delicious, authentic Creole dish that’s perfect for celebrating Mardi Gras! I have some more Louisiana-inspired recipes coming in the next couple of days, but in the meantime, check out this Chicken and Sausage Gumbo and this Cinnamon King Cake! Place all ingredients in a medium-sized dutch oven or pot. Add 6 cups of water, or enough water to cover the ingredients. Bring water to a boil over high heat, then reduce heat and allow mixture to simmer for 45 minutes. Skim off any foam on top of the pot, and then pour mixture through a fine-mesh strainer. Add the onion, celery, and green pepper, and cook over medium heat for 5-6 minutes, stirring often. Add the Cajun seasoning, paprika, salt, minced garlic, and tomatoes; continue cooking over medium heat for another 2 minutes, stirring often. Slowly whisk in the shrimp stock, stirring constantly, until the mixture reaches the thickness of gravy. Mix in the shrimp and green onions; cover the pan and reduce heat to low. Cook for 8-10 minutes or until shrimp are cooked through. Add the parsley and stir until well combined. Serve over steamed white rice; garnish with additional sliced green onions, parsley, and hot sauce. Instead of making your own shrimp stock, you can substitute canned shrimp or seafood stock instead. 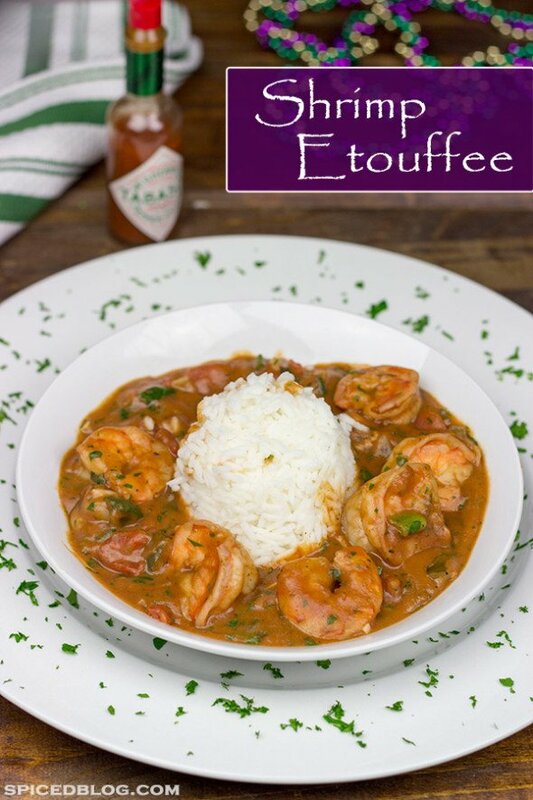 I have never ever heard of Etouffe before, but it surely looks awesomely yummy! Love all the spices. White rice is a staple in our cuisine and this looks so good, I bet my husband will love it! Thanks for sharing David! Oh, you’ve got to make some etouffee, Wendy! It’s basically a delicious sauce served over rice. The hardest part is making the roux, but it’s only hard because you can’t hurry it up by increasing the heat (it’ll burn if you do). I hope you get a chance to make it! Thanks so much, Terra! This is hands-down one of my favorite recipes ever…you totally need to make it! Just take your time making the roux and the rest of it is super easy. Enjoy!! 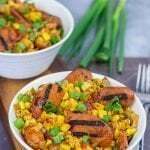 I just tried this recipe and it was pretty good! Thank you! I had etoufee when I did an internship in Louisiana and haven’t had it since so I’ve been wanting to learn how to make it – my only question or trouble was the roux…it wouldn’t brown. I got it to a dark yellow but that was it and that was over 30 minutes. Can you give any suggestions? I feel like I am missing some flavor because it didn’t brown like it should have. Hey Jasmine! 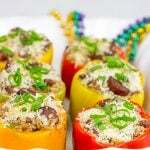 I absolutely love this etouffee recipe, and I love Cajun food! Thank you so much for making it. 🙂 So making a roux is definitely one of the key pieces of this recipe (and for many other Cajun recipes, too). It’s a long, slow process. If you go hotter on your stove temperature, then it will cook faster…but you run a serious risk of burning the roux. (You know it’s burnt if little black specs start to show up in it.) At that point, you really should just dump it and start over. That’s why I like to go a little lower on the heat, but it takes a long time. Here’s the thing, though: you think it’s doing nothing for a long time, and then all of a sudden it starts to brown very quickly. I put 18-20 minutes in the recipe, but that time varies greatly based on the heat of your stove. Lower heat takes longer but ensures that you don’t burn the roux. I made this recipe a couple of weeks ago, and I recall the roux taking a solid 30+ minutes. It’s just a slow process. But that’s where the flavor comes from. Give it a shot again! Making a roux from scratch is one of those ‘harder’ kitchen skills to master, but it can totally be done with a little practice. It sounds like you were almost there last night! Like I said, it goes from yellow to brown to dark brown very quickly once it does start to turn color. I hope this helps. It’s so difficult to explain how to make a roux…much easier to just stand there and show someone in person! If you do try again, keep me updated on the process. I’m happy to edit the instructions above if you have tips for other readers, too. Have a great weekend! Hi David! Still poking around your site and I am getting hungry! I have crawfish tails in the freezer and they are screaming at me now! I make red beans and rice with Andouille and smoked pork at least once a month – my husband, who is not a true fan of beans, actually asks for it! And, OMG, bread pudding with bourbon sauce! I really wish I lived in New Orleans, the only drawback is I would weigh twice what I do now! 🙂 Might be worth it! Haha…you and me both, Dorothy! I loved my time living down in south Louisiana, and I would love to get back down there. Red beans is one of my all-time favorites, too. My wife likes them, but I absolutely love them! And this etouffee is another favorite. We actually made this not long ago, but we switched it up and made chicken instead. (We had some friends coming over that couldn’t eat shellfish.) Bread pudding + bourbon sauce? Don’t get me hungry like that on Monday morning…I’m still working on my coffee! Haha!